Fandom started with t-shirts and posters. A simple way for geeks to show their love for a favorite anime or video game. That wasn't enough. From there, it spread to lunch boxes—bento boxes in Japan—and figures. Now, in 2011, nerd culture is highly developed. Whether it's "hug pillows" or character-shaped desserts, geeks have a plethora of ways to show their nerd adoration. Add another that laundry list. Add curtains. Japanese curtain retailer Curtain Damashii (Curtain Soul) is offering a slew of otaku-friendly drapes, with a whole host of games and anime represented: Fate/Zero, Angel Beats!, Steins; Gate, and many, many more. Pricing varies according to size, and some of the curtains liven up a living room. Others, well, yeah. 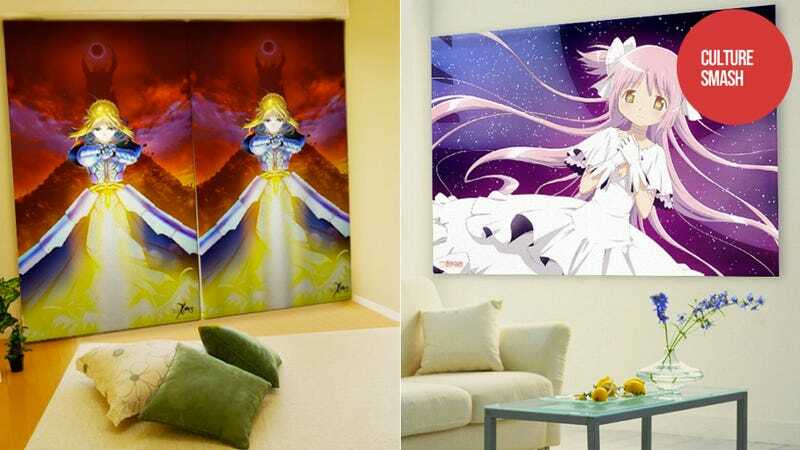 With the recent polls in which Japanese women do not want to find moé (think young girls with huge eyes) décor in guys' rooms, these curtains are for discerning customers not fussed with impressing real girls. In the gallery above, check out some of the various curtains offered. More can be viewed on Curtain Damashii's official site.